The Haunted Mansion is known as the pinnacle of Disney Illusioneering — from the Pepper’s Ghost effect in the ballroom to the one-way glass of the Hitchhiking Ghosts. But consider the Haunted Mansion Stretch Room in the Magic Kingdom, which actually has two stretching rooms. And all the stars must align or the whole illusion falls apart. Fans of Disneyland’s Haunted Mansion Stretch Room know that it is born of necessity. It doesn’t take long to notice that subtle lurch in the floor (a hint that you’re in an elevator). 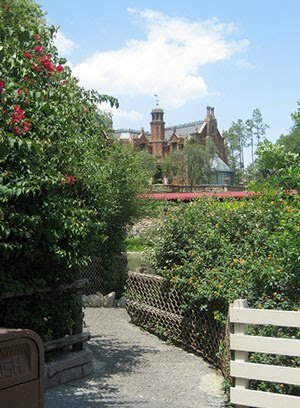 The Haunted Mansion is such a large ride that they needed to find some way to get guests below the railroad berm so that they could access the large show building beyond. Walt Disney World had no such space issues — and thus no reason for an elevator. But the Stretch Rooms remained because they provided such a great introduction to the ride. Incidentally, except for the foyer and parts of the exit, the Stretch Rooms are the only parts of the ride that are contained within the famous Mansion facade itself. In order for the stretching effect to work — especially in Disneyland — you cannot allow the audience to see the gaps that separate the moving pieces (in Disneyland, the floor; in WDW, the ceiling) from the stationary piece. This is done by creating a “cage” for the audience to stand in that is completely self-contained. This is the wood-paneled section of the gallery, with the mantle of gargoyles being the barrier that hides the gap from the moving pieces. At no point can a guest reach out and touch a wall (or a painting) that appears to be stretching. The gargoyle mantle is even more critical for another reason. In order to see the stretching paintings and hear the Ghost Host, we need lights and speakers. But there is simply no place to put them in a stretching room because seeing them would destroy the effect. The speakers are hidden in the mantle itself behind fabric painted to look like wood, and they are arrayed in a complete circle to give the effect of the Ghost Host flitting around the room. The lights are above the mantle in order to illuminate the paintings, but hidden from sight. The audio here has two jobs. It sets the stage for the story, obviously, but just as important, it provides the necessary creaks and groans to certify that you are seeing a supernatural stretching room while masking the sound of the machinery behind the walls. There is a movie trick known as practical lighting, in which the light source illuminating an actor or set is theoretically coming from a logical light source — like a table lamp or a window — even though the cinematographer has actually lit the set with giant movie lights that are not visible on camera. Now you know why the gargoyles hold flickering candles. In order for the paintings to appear to be stretching along with the walls, the top and the bottom of the picture frame itself must remain stationary with respect to the lower and upper bounds of the stretching. Look closely at the frame and you can see that the top and bottom sections are actually an inch or so apart from the wall, as is the section of wallpaper directly below and above. This allows the entire stretched portrait to reappear from behind the frame boundaries. As with any great trick of perspective, the wallpaper simply has to be a vertical stripe or the effect won’t work. Any horizontal or pictorial pattern would destroy the effect because the audience would see the patterns revealing themselves as the ceiling moved upwards. The ceiling is nothing more than fabric painted that will turn invisible when lit from behind. This accounts for how that hanging body suddenly comes visible. He is hanging up there the entire time, just waiting for the ceiling scrim to reach him.Oh, and the light source? Lightning flashes from windows at the top of the room, on all four sides of the body. Oh, and the light source? Lightning flashes from windows at the top of the room, on all four sides of the body. While not quite a circle, the shape of the room is just disorienting enough that audiences can lose track of which wall they entered through, allowing them to be surprised when the door opens again to reveal a completely different exit room. They intone that you should “kindly drag your wretched bodies into the dead center of the room.” Will this help you to see the effect better? Yes, but it also stops you from leaning on the exit door, which will slide open unexpectedly in the dark. Step 10 – Is the Entire Haunted Room Actually Stretching? Or is it Your Imagination? Disney usually has very specific reasons for creating movement that are often taken for granted. There’s an extremely subtle motion in the Haunted Mansion Stretch Room, but it really is the secret to making the whole stretching effect come together. We mentioned earlier that the lower part of the stretch room is a cage, and only the ceiling (in Walt Disney World) moves. But that’s not entirely true. During the course of the Ghost Host’s speech, the gargoyle mantle is also moving upwards, but at a slower rate than the ceiling. This provides a proportionate stretching effect, such that the wood-paneled cage below the gargoyles will still appear to be the same proportion in respect to the gallery above it once the stretching is complete. At last, we come to the least relevant portion of the effect: the portraits themselves. Like other portraits in the Haunted Mansion, they’re just plain old slide-and-reveal gags, expertly conceived by Marc Davis. They’re the magician’s left hand, the thing you’re watching while the right hand does all the work of the trick. This entry was posted in Disney Theme Park Hidden Secrets and tagged Disneyland, Haunted Mansion, Illusioneering, Magic Kingdom. Bookmark the permalink. linger in the stretch room after all the guests have moved into the loading area, but before the doors close in preparation for the next ride cycle, and you will be commanded by increasingly urgent spectral voices to “get out”. I have known of this, but never actually stayed to hear it. I should try it next time. 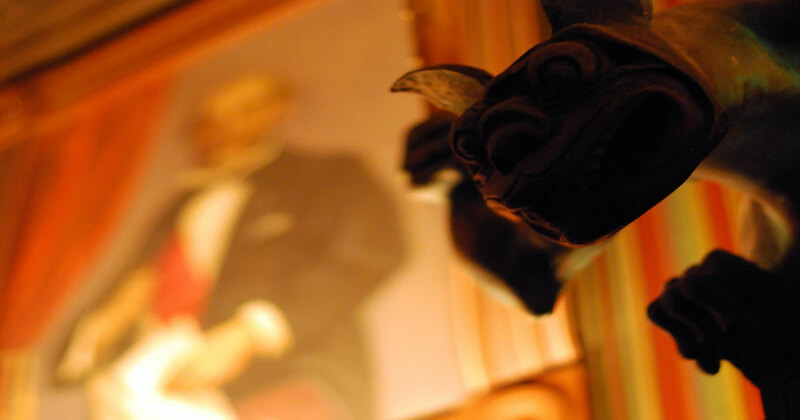 This is the first blog that mentions that the haunted mansion has two stretch rooms. As a child going to Walt Disney world ( since inception in 1971) I was sure there was two as each time I rode the haunted mansion ( and I did it various times each day I was there) you were sent either left or right. As an adult I don’t seem to notice that BUT I was sure it was part of my childhood memories. I searched and never found a site that actually confirms that there are to stretch rooms at the mansion. Do they still use both? Do both lead to the same ride or are there different rides or two identical rides? There are two stretch rooms used every day. They alternate with each other. Both open to the same load system and the same actual ride.